No longer satisfied treading only familiar territory, today's restaurant wine programs respect the classics but also strike out for parts unknown, and these voyages of discovery can expand wine lovers' horizons. 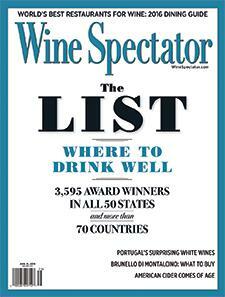 Portugal: A free chart offers an alphabetical list of all Portuguese wines in barrel reviewed for the tasting report in this issue. Brunello: A free chart offers an alphabetical list of all Brunello wines reviewed for the tasting report in this issue. Blue Hill at Stone Barns - Pocantico Hills, N.Y.
Murray Circle - Sausalito, Calif. The Restaurant at Meadowood - St. Helena, Calif.
WineSpectator.com: Introducing our new Restaurant Awards site: Our free online Restaurant Search has been upgraded so you can easily find the 2016 award winners nearest to your current location, with maps. Or look for the perfect dining spot in any location by wine strengths, cuisine type, pricing and more. Plus, find all our great dining articles in one convenient location: restaurant guides, sommelier and chef interviews, news and our tributes to our 2016 Grand Award winners. WineSpectator.com: Introducing Wine Spectator's Private Guide to Dining: Our new, twice-monthly, free e-mail newsletter spotlights the best restaurants for wine lovers, sharing tips from the top lists in major cities to great family-owned restaurants to noteworthy pizza places. Get great wine picks, keep on top of food and beverage trends, learn about new restaurant openings and more. FREE: Portugal Alphabetical Listing - More than 300 wines were reviewed for this report. A free alphabetical list is available. WineSpectator.com members can access complete reviews for all the wines tasted using the online Wine Ratings Search. WineSpectator.com: See who else was at Wine Spectator's Magnum Party in our online photo gallery. FREE: Brunello Alphabetical Listing - More than 130 wines were reviewed for this report. A free alphabetical list is available. WineSpectator.com members can access complete reviews for all the wines tasted using the online Wine Ratings Search. WineSpectator.com: Find restaurants with great wine lists in our Restaurant Search. With more than 3,600 award winners, pick the perfect dining spot by location, award level, wine strengths, cuisine type and more. WineSpectator.com: Get new collectible wine picks, expert tips, news and cellar design inspiration in our free, twice-monthly Collecting e-mail newsletter. FIND THE WORLD'S BEST WINE LISTS We're introducing our new Restaurant Awards website and iOS app, so you can easily find the 2016 award winners nearest to your location, with maps. Or look up the perfect dining spot in any city, state or country, choosing by wine strengths, cuisine type, pricing and more. Download Restaurant Awards free from the App Store. Or visit restaurants.winespectator.com to search more than 3,500 restaurants and find all our great dining articles in one convenient location: restaurant guides, sommelier and chef interviews, news and our tributes to our 2016 Grand Award winners. PRIVATE GUIDE TO DINING Our new, twice-monthly free e-mail newsletter spotlights the best restaurants for wine lovers, sharing our guides to notable dining destinations with great wine lists—from steak houses and seafood restaurants to iconic hotels and resorts. Get top wine picks, keep abreast of food and beverage trends, learn about new restaurant openings and more. SOMMELIER TALKS Meet the people behind the world's great wine lists: Get pairing advice and find out which wines excite them most. LIGHTS, CAMERA, POUR! 10TH ANNUAL VIDEO CONTEST Share your wine story and win great prizes! Pick a topic, grab your camera or phone and have fun! Submit your shorts to Wine Spectator's Annual Video Contest and you could attend our spectacular Wine Experience weekend or a Grand Tour tasting. Our editors will select the finalists, then WineSpectator.com viewers will vote for the winning video. Entry deadline is Monday, Sept. 5. Check out the rules and previous years' finalists. About the Restaurant Awards: Learn how the awards got started as editor and publisher Marvin R. Shanken recounts his inspiration and how it helped reshape the U.S. dining scene, and hear from dining pros about how the awards help their guests. How to Work a Wine List: Tips from the pros on how to feel comfortable ordering a bottle with dinner, asking for help picking the right wine for your occasion and finding good value. No More Tipping, With Danny Meyer: Why are some U.S. restaurants eliminating gratuities in favor of a service-included menu? Get answers from restaurateur Danny Meyer of Union Square Hospitality Group, which includes The Modern and Gramercy Tavern in New York. 341,000 Expert Wine Reviews Wondering whether you'll like a particular wine? Or whether one you've already purchased is ready to drink? All of Wine Spectator's ratings can be found in our site's Wine Ratings—with score, price, tasting note and drink window.